Purgatory Cove is a small pond connected to the Charles River in Waltham, MA. You can park on Forest Grove Rd and fish on either side of the street. While there is limited spots to cast from in between the trees, I've only ever seen 1 or 2 other people fishing so I've had plenty of space to work. This place has consistently produced fish for me, including a couple of 3lbers during my last trip. 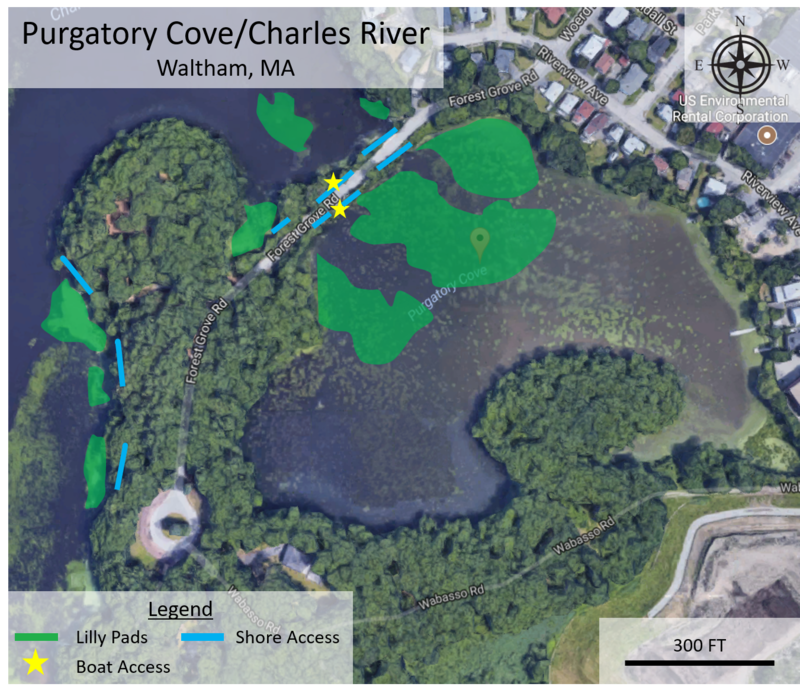 You'll quickly see that there is heavy vegetation along the shore, especially on the Cove side. Most of my success has come from landing a senko or rubber frog into holes between lilly pads. On the river side, it's a little more open and you've got space to throw something with an open hook. I've caught a few running a white spinner along the weed line. You can also find some shore access by driving up the end of the road to the round about in the image below. There's a path going up the side of the Charles, which has various opening to cast from. I've only fished from the shore here, but I'm dying to get a boat out on there. I constantly see fishing breaking on both the cove and river side just a little bit out of casting range. There's also a bunch of structure in the cove that I'd love to fish, including a bunch of tree stumps in the southern corner. It's a pretty small spot and not too much more to say. Tight lines! Billington Sea is a warm water fed pond in Plymouth, MA that seems to be a very popular spot and supposedly holds some big bass in the 5-7lb range. I fished there recently and unfortunately did not have much success finding any lunkers, but did pull in about 8 bass in 3 hours. I didn't fish anything to the west of Hathaway point but I'd like to go back and try again as I know my luck will be better the next time around. This pond has a little bit of everything when it comes to structure. Along the northern shore, near the boat ramp, you'll find some lilly pads and some bushes that you can fish. There's a creek mouth in the northeast corner that gets pretty shallow but definitely holds some fihs. Along the southern shore, where it is more developed, you'll find plenty of docks to target. The outer edges are shallow, anywhere from 1-5ft deep, while the middle drops down to about 10 ft. 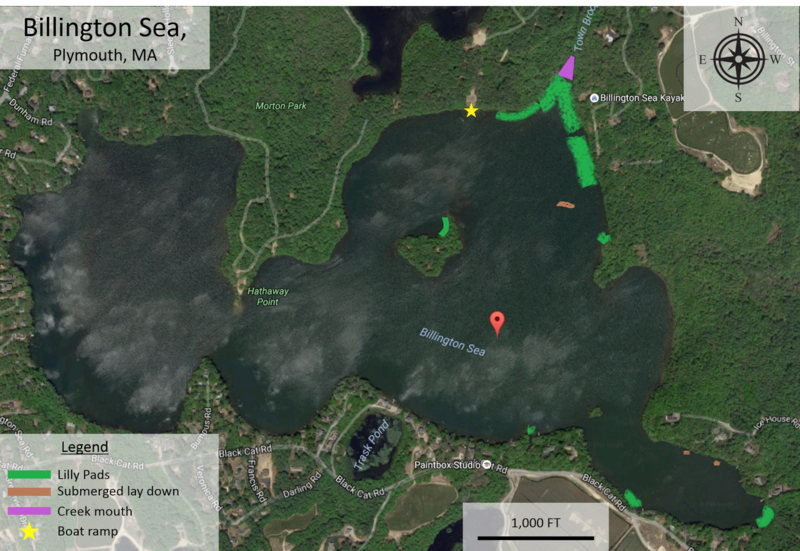 The island in the middle offers some quick drop offs that I fished with my MS Slammer and a shallow diving scatter bait to see if I could find any bass hanging around the ledge. There's also a good amount of downed trees if you can find them, I've marked a few on the map below. Most of my success came along on the eastern shoreline and in the cove in the southeast corner. I had multiple top water strikes as I fished my senko worm quickly, trying to cover ground. I also caught a couple on a fat body crank bait, working it just outside the weedline. I think the next time around, I would focus more on the windblown points where it drops off quickly and throw some larger swimbaits, like my Spro SB BBZ60 or Spro BBZ-1 Rat. As far as I can tell, there is no shore access outside of the boat ramp and maybe Hathaway point, if the road is open. When I first arrived, I went through Morton Park, only to see that the road was blocked off. You'll want to access the boat ramp via Morton Park Road, off of Billington St.
More to come after my next trip here. Boat Ramp? Yes, but not paved. 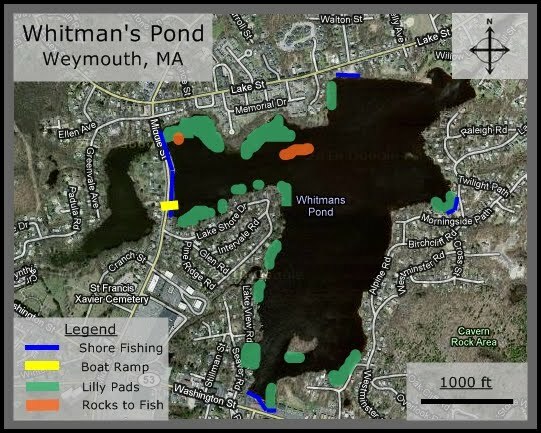 Whitman's Pond is a place I have been fishing for years with mixed results. It used to be a great spot but I think fishing pressure and the overabundance of vegetation is having a negative impact. That said, there are still big bass to be caught in here - each year I hear about a handful of 5 pounders getting caught there. There are lilly pads along both the northern and southern shores and I have caught nearly every fish there either in or near the lilly pads. Early in the season, you can work the shores but as the weeds get there, you need to start fishing a little further into the water. 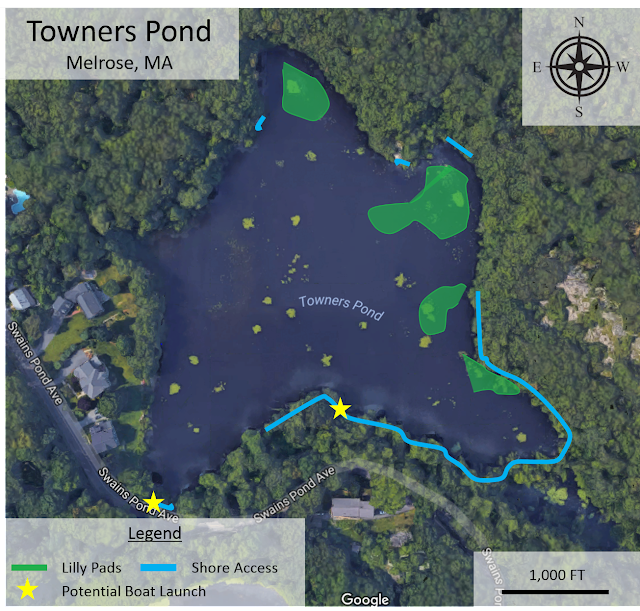 For the most part, I have worked the shores both on the North and South side of the pond which can be easily accessed by a boat ramp on Middle St. There is a sand bar in the middle where I have had some success as well as two natural springs where some bass seem to congregate. There is also a beach on the south east corner that is always active with bass. The beach can be fished from the shore by going down Westminster St off of route 53. You can also fish off the long shore line on Middle St but that is highly over fished, so if you're going to do that I suggest working the corners more than the middle. The weeds are really thick so if you plan to use an open hook lure, I would suggest using a top water lure. 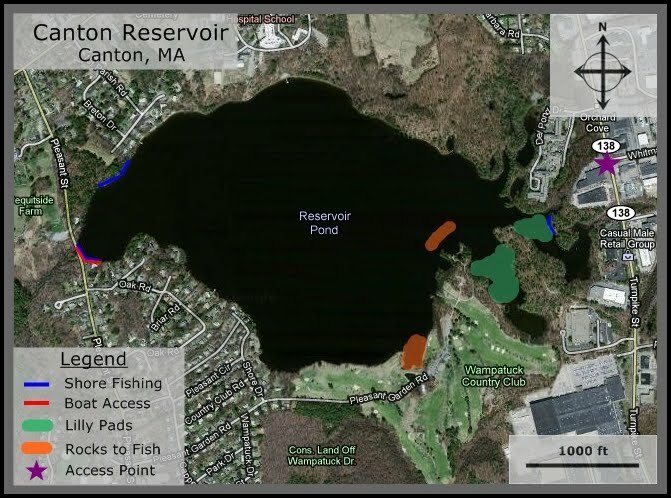 There are some spots, near the beach and on the south side of the pond near a restaurant called Canoli's that are some what weedless where you could use a spinner or crank bait. It can get pretty windy at times which makes it challenging to fish but usually it is coming off of the Middle St shore so if you're fishing off the shore it will only lengthen your casts. Overall this is a great fishing spot. I go out every time expecting to catch a couple good size bass. Good luck!